As Richard Campbell describes, tropical fruit has fascinated Bill Whitman since his youth. He chased his passion around the tropical world, bringing extraordinary plants back to his own collection and to Fairchild. Along with the Garden's internationally recognized tropical fruit curator, Dr. Richard J. Campbell, and other tropical fruit enthusiasts, Whitman gathered important specimens that until this time had to remain in our research center greenhouse. 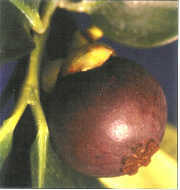 Many of these fruit plants cannot tolerate Miami's relatively cool winters and require a specialized conservatory. For many years, Bill and Angela Whitman had dreamed of creating a living legacy based on Bill's love of ultra-tropical fruit trees. With the advice of Garden trustee and friend, Dr. Robert (Bob) McNaughton and Dr. Richard J. Campbell, along with other key Garden volunteers and staff, the Whitman Family very generously agreed to create a place in which to display this collection. 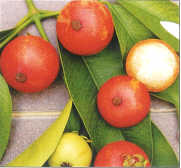 Their donation of a million dollars made the William F. Whitman Tropical Fruit Pavilion possible. Angie and Bill Whitman's extraordinary generosity went beyond the construction of the pavilion. They and other members of their family became so passionate about the project that they wanted to do more to ensure Bill's legacy lived on. At the celebratory lunch, it was announced that the Whitmans were presenting Fairchild Tropical Garden with an endowment totaling five million dollars. This historical gift, the largest ever given to the Garden, ensures the future of our innovative and unique tropical fruit program. To say that the trustees, members and staff of Fairchild were overwhelmed would be an egregious understatement. 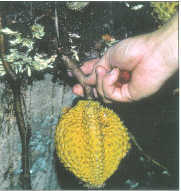 Gifts of this size are rare in the botanical garden world. There are no adequate words to express our gratitude for this magnanimous gesture of philanthropic support. 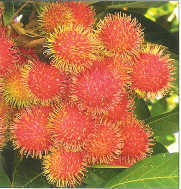 It was the Whitmans' desire to introduce to South Florida and the world these interesting and wonderful varieties of tropical fruits, and they have done just that. Their generosity and kindness to Fairchild Tropical Garden is truly the gift of a lifetime. 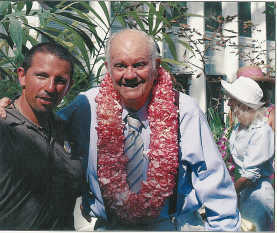 The father of the South Florida tropical fruit craze was David Fairchild. Bill Whitman, the other growers of his generation, and the new generation, as characterized by Fairchild's Senior Curator of Tropical Fruit, Dr. Richard J. Campbell, are driven by shared instincts, namely, to grow what is new and what is deemed impossible to grow. With Richard, that instinct is tempered by a commitment to research and training. The Whitman Fruit Pavilion reflects the Garden's commitment to tropical fruit; as the cornucopia of the tropical world unravels, this commitment has never been more relevant. When you visit the Pavilion, you will sense the excitement and passion that surrounds tropical fruit. If you too want to grow tropical fruit, examine the plantings that surround the Pavilion to identify the extensive variety that can be grown in any Miami garden. As the temperatures cool, we look forward to welcoming you to the Garden, and invite you to explore not only the William E Whitman Tropical Fruit Pavilion, but also the Garden's landscapes and collections. Behind the scenes, our horticultural teams are maintaining the wonderful grounds, the researchers are working to explore the world of tropical plants, the education team is sharing that world with thousands of school children in the communities of Miami, and the events and facilities teams are keeping the special events, festivals and weddings running without a hitch. We are so much more than a garden; we are a botanical garden with a local and global relevance. The growing status of Fairchild is only possible because of the extraordinary generosity of our many supporters and volunteers. Thank you. Garden benefactor William F. Whitman has long been driven by the desire to be the first to bring to fruit the most exotic of tropical species-plants whose cultural requirements are unknown or hard to achieve here in South Florida. He has dedicated the better part of a lifetime to this quest. 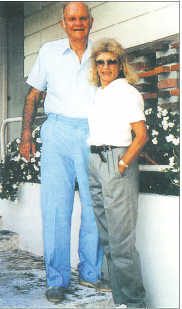 A stroll around his Bal Harbour garden is a living testament to his vision. His fruit garden features the very finest selections from the world of tropical fruit, painstakingly cultivated to coax the best out of each tree. Soon Mr. Whitman will expand the influence of his work with the dedication this November of the William F. Whitman Tropical Fruit Pavilion at Fairchild Tropical Botanic Garden. The pavilion, funded by the generous million-dollar endowment from the Whitman family, will allow Fairchild to bring these exotic beauties to the public eye and, ultimately, to secure their future in this hemisphere. Nearly a century has passed since Dr. David Fairchild first wrote about the immense potential of exotic tropical fruit in the Americas. He and other tropical fruit pioneers like Wilson Popenoe were enchanted by the allure of exotic tropical fruit and they predicted their emergence in the mainstream United States marketplace. Yet, as we enter the new millennium, the durian, mangosteen, duku and tarap remain unknown, or, at best, recognized only as novelties by a few consumers in the United States. We are confident the situation is soon to change. With the opening of the Whitman Tropical Fruit Pavilion, research to determine suitable cultivation techniques can be carried out, allowing the century-old dreams of David Fairchild and Wilson Popenoe to become reality. 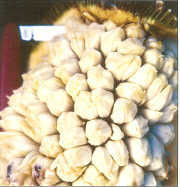 With the knowledge gained, exotic tropical fruit could be finally produced commercially and marketed in the Americas. The Whitman Pavilion has been designed to provide the necessary roof height, the low pH soil and the superior water quality necessary to grow and bring to fruit the world's most alluring treasures. Imagine the sight of a mature mangosteen (Garcinia mangostana) tree, heavily laden with its legendary deep purple fruit, or the earthy sweetness of the salak or snake fruit, Salacca zalacca. 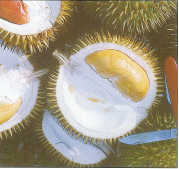 Visitors will be able to bask in the shade of the majestic Asian tarap (Artocarpus odoratissimus), while the intoxicating aromas of the durian kura-kura (Durio testudinarium) and bembangan (Mangifera pajang) whisk you away to a new experience. For the first time in history, this delightful experience will be possible within the boundaries of the mainland United States. Like the Garden itself, the new Pavilion is more than a display exhibit to please the senses. Each priceless specimen tree has been carefully selected for its scientific and horticultural value. Superior clones provide the framework of the Whitman Tropical Fruit Pavilion collection, the result of numerous collecting expeditions over the last decade to the Amazon Basin, Brunei Darussalam, Indonesia, Malaysia and Thailand. The specimens brought back are superior clones — the result of decades of selection both by native peoples and horticultural researchers. We need this improved stock to achieve our goals of earlier fruiting, manageability and consistent fruit quality. The use of seedlings has doomed many projects, including some of the pioneering efforts of Dr. David Fairchild himself. 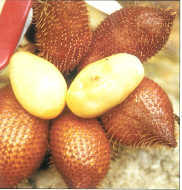 The Tropical Fruit Program is committed to innovative horticultural propagation and pruning techniques, keeping the work carried out at Whitman Tropical Fruit Pavilion on the cutting edge of technology. These tools will allow us to mold our specimen trees to the size limitations of the Pavilion structure and to determine the degree of their adaptability to modern production systems. Only then can we move towards making exotic fruit a viable commercial option in this hemisphere. The Whitman Tropical Fruit Pavilion, as a public showcase for the Fairchild Tropical Fruit Program, will further Mr. Whitman's dream of bringing superior tropical fruit to the Americas. We want to make these fruits more available to the average person. 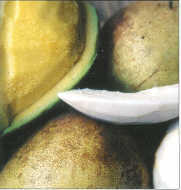 We can make use of genetic and horticultural advancements to enhance the status of exotic tropical fruit in this hemisphere. Thanks to the vision and philanthropy of William E Whitman, we have a suitable program and the necessary tools in the Whitman Pavilion. It is time to put the trees in the ground and our plans to the test.